The direct conversion means that an RF signal is directly down-converted to a Base-band (BB) signal or vice versa without any intermediate frequency stages, and therefore it is also referred to as zero IF architecture. The direct-conversion architecture has many attractive features. 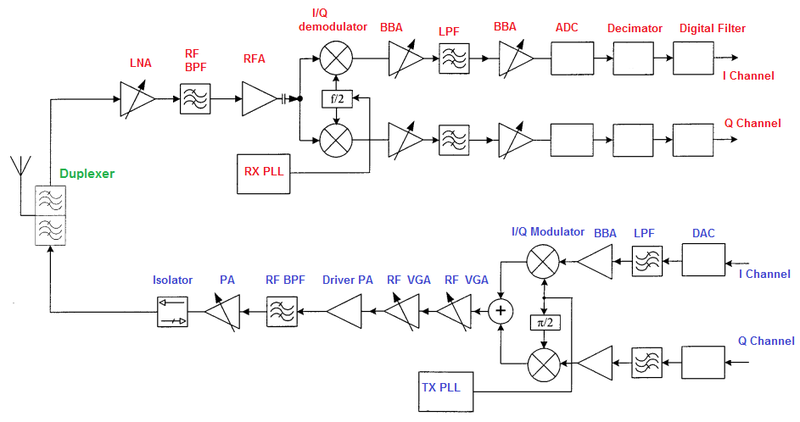 The direct-conversion receiver has no IF, and thus the expensive IF passive filter (SAW filter) can be eliminated, and then the cost and size of the overall transceiver are reduced. The channel filtering of the direct-conversion receiver is implemented in the analog base-band by means of active low-pass filter. Compared with the receiver, the direct-conversion transmitter has fewer issues, and it is relatively easy to be implemented. 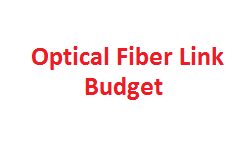 The function of the receiver BPF in the duplexer is to suppress the leakage power of the transmission and other out of receiver band interference.The received signal after preselecting of the duplexer is amplified by an LNA, and it is further filtered by an RF filter. The filtered RF signal is then directly down-converted into I and Q channel BB signals by an I/Q down converter also called as quadrature demodulator. The BB signals in the I and Q channels are synchronously amplified, but their 90* phase offset will be kept unchanged as possible. 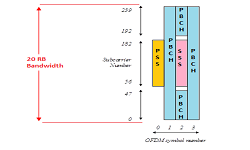 In the direct conversion receiver, approximately 75% of the overall receiver gain is obtained from the analog base-band block when the receiver operates at its high gain mode. There exists a low-pass channel filter in each of I and Q channels. Unlike the superheterodyne receiver, the channel selectivity now mainly depends on the stop-band rejection of the low pass filter without any passive band-pass filter assistance. The amplified and filtered BB analog signals in the I and Q channels are converted into digital signals by analog-to-digital converters (ADC), and the digital signals then pass through digital filters to further suppress nearby interferers and enhance the channel selectivity. The I and Q BB signals coming from the transmitter digital-to-analog (DAC) converters first pass through low-pass filters to make the adjacent channel and alternate channel emission levels further suppressed and to eliminate aliasing products. The filtered and amplitude attenuated I and Q BB signals both are directly up-converted to RF signals, and they are then added together by an IQ modulator. The composite RF signal is amplified all the way up to the RF power amplifier (PA). 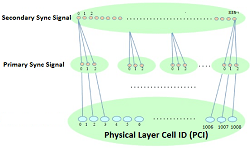 In direct conversion, as the signal of interest is converted to baseband very early in the receive chain, without any filtering other than RF band-selection, various phenomena contribute to the creation of DC signals, which directly appear as interfering signals in the band of interest. The LO may be conducted or radiated through an unintended path to the mixer’s RF input port, thus effectively mixing with itself, producing an unwanted DC component at the mixer output. Second-order distortion is another severe threat to the direct- conversion transceiver if the distortion is not low enough. Frequency-closed strong interferers and/or an interferer with an amplitude modulation (AM) can be turned into low-frequency in-channel interference products including the DC component by the second-order distortion. 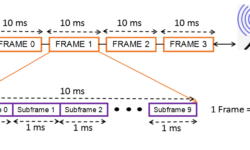 The in-channel bandwidth interferers may propagate in the BB block and then possibly deteriorate the direct-conversion receiver performance or even block the receiver. In the direct-conversion receiver, the received RF signal after amplifying in the RF front-end is directly down-converted into two quadrature BB signals – i.e., I and Q BB signals. The I and Q BB signals propagate and are amplified in separate I and Q paths or referred to as I and Q channels. Generally speaking, it is difficult to keep the I and Q BB signals having perfect balance in their magnitude and phase when they pass through two completely separate paths even if using the-state-of-the-art highly integrated RF circuits. A wide range of the gain control in both BB channels makes it even more difficult to maintain the balance between these two signals. The outstanding feature of the direct-conversion transmitter is that its transmission contains much less spurious products than the superheterodyne transmitter. This architecture does not need a frequency plan, which is usually very time-consuming work and hard to validate. The direct conversion has no image. So extra effort for removing the image as done in SuperHyterodyne is eliminated.